Exclusive Deals With The Medplaya Hotels In Benidorm. The Medplaya group own and operate five of the most popular hotels here in Benidorm. Hotels to suit all ages and they offer such great value for money! In conjunction with the Medplaya hotel group, Benidorm Tourism are able to offer you competitive prices when you book direct with us – We are sure we can beat even all the comparison sites with our special deals! 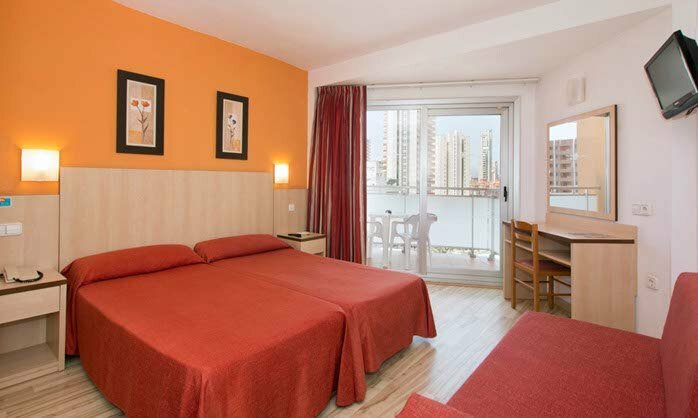 The Hotel Regente is located in the centre of Benidorm, just a few minutes from the Levante Beach. It has recently refurbished double rooms, all with full bathrooms, air conditioning, heating and balconies. The restaurant is buffet-style and there is a wide variety of Mediterranean and continental dishes to choose from. There are two outdoor swimming pools. There are daily daytime and evening entertainment programs throughout the year. Enjoy your holidays filled with activities, sun and the beach. The Costa Blanca is one of the most cosmopolitan areas of Europe and its unofficial capital, Benidorm, is one of the best symbols of the Spanish tourism industry. The Hotel Regente has recently refurbished double rooms complete with full bathroom, balcony,twin beds, air conditioning, heating, telephone, and optional safe deposit box. The Hotel Regente has recently refurbished double rooms complete with full bathroom, balcony, air conditioning, heating, telephone, and optional safe deposit box. Take exit 65 off the AP7 Highway (Benidorm Levante). Go down the Avda. de Europa until you reach Avda. Mediterráneo, turn left and follow the Avda. Mediterráneo until the end. At the statue, turn left down the Avda. L’Atmetlla de Mar and turn down the fourth street on the right. The Taxi Rank is situated on floor -1 of the airport. The cost is between 75€ – 85€ and there may be supplements for car seats, bank holidays / Sunday/ Night service. • Two outdoor swimming pools. • Gala dinner once a week. • Air-conditioned restaurant with capacity for up to 400 people with terrace and pool views. • Main bar for up to 130 people. • Free Wifi in reception. • Air conditioning and heating depending on the weather. • Check-in time: 12:00 a.m.
• Check-out time: 12:00 a.m. 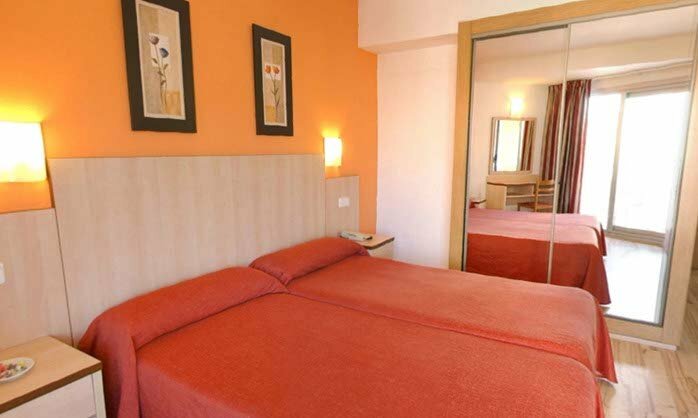 The Hotel Regente is located in the centre of Benidorm, just a few minutes from the Levante Beach. Our entertaiment team organizes activities such as petanque, shooting gallery, gallery arch, billiards, darts, ping pong, games room, reading room. In summer entertainment program includes activities for adults and children. Evening program offers variety of shows such as musical tributes, acrobats, magicians, singers, karaoke, games. Payment will be made in Euros and will be taken online at the time of booking by means of a valid credit card, or by Bank Transfer which must be received at the latest 21 days prior to your arrival date. Benidorm Tourism on behalf of MedPlaya Hotels will automatically cancel any reservations for which payment has not been received 21 days prior to your arrival date. Cancellations confirmed up to 48 hours prior to arrival date will incur NO cancellation fees. In case of cancellation of reservation within 48 hours of the arrival date, a cancellation fee – equal to one night accommodation, will be charged. If you do not arrive at the hotel on the reserved arrival date, your reservation will be automatically cancelled. * NON REFUNDABLE ROOM TYPES MUST BE PAID ON CONFIRMATION OF THE RESERVATION, WITH A VALID CREDIT CARD – THESE BOOKINGS CAN NOT BE MODIFIED OR CANCELLED.